SANDY SPRING, Md. 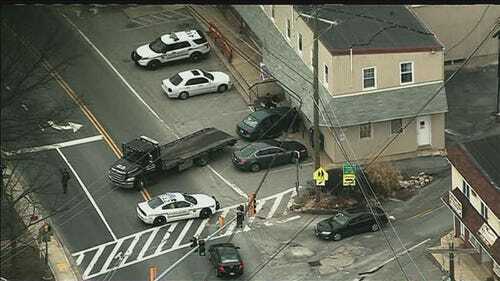 (WUSA9) -- A vehicle hit the guard rail of the Sandy Spring post office Tuesday morning, according to Montgomery County Fire and Rescue. The post office is located in the 900 block of Sandy Spring Road next to Urban BBQ. Sky9 was on the scene. A neighbor of the post office said a Hyundai elantra hit the guard rail. Two cars were involved in the crash and the second car had minor damages, according to the neighbor. Part of a wall of post office was damaged and officials say the post office is still open. OLNEY, Md. (WUSA9) -- A woman died in a single vehicle collision in Olney early Sunday morning, according to Montgomery County Police. The accident happened around 4:11 a.m. in the 3800 block of Hines Road and Blossom View Drive in Olney, police said. The investigation shows that the man driving, Robert Walter Lee, 29, of Gaithersburg, lost control of the vehicle. The 2000 Ford Explore was going east on Hines Road in the direction of Georgia Avenue when it left the road just before Blossom View Drive hit a tree and the light support pole, police said. Police are still investigating why the vehicle left the road. Lee was taken to the hospital with non-life-threatening injuries. The passenger, 43-year-old, Lisa Ann Smith of Olney died at the scene of the accident, authorities said. Authorities are looking into the possibility that alcohol may have been a factor in the accident. COLUMBIA, Md. (WUSA9) -- Two suspects were arrested in connection with an ATM card skimming device in Columbia, Md., Howard County Police said. Police arrested Alin Tomescu, 35, of Baltimore, Md. and Viorel Tomulescu, 52, also of Baltimore, Md. They are both being charged with possessing a skimming device and conspiracy to commit theft, authorities said. Tomescu was seen on Saturday morning at a SunTrust Bank ATM in the 8200 block of Snowden River Parkway with his face partially covered, authorities said. He ran away as an officer tried to make contact with him, police said. Police pursued the man and found Tomulescu who had been waiting nearby, authorities said. A skimming device had recently been put on the ATM, authorities said. Police are not sure at this time if customers' information has been compromised.